Venera 9 sent image telemetry for 50 minutes, before burning up. It scanned 174º of the panorama from left to right, and then 124º scanning right to left. The upper image is the raw 6-bit telemetry, about 115 by 512 pixels. Automatic gain control and logarithmic quantization were used to handle the unknown dynamic range of illumination. The raw image was converted to optical density according to Russian calibration data, then to linear radiance for image processing. It was interpolated with windowed sinc filter to avoid post-aliasing (a "pixilated" appearance), and the modulation transfer function ("aperture") of the camera was corrected with a 1 + 0.2*frequency**2 emphasis. This was then written out as 8-bit gamma-corrected values, using the sRGB standard gamma of 2.2. 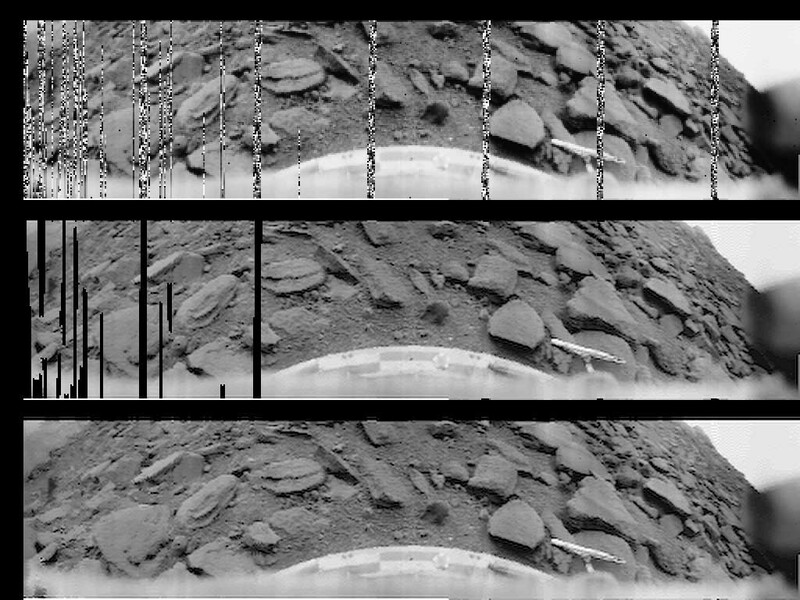 Some of the telemetry bars on the right were replaced with data from the second section of image. The bottom image is digitally in-painted, using Bertalmio's isophote-flow algorithm, to fill in missing data. Copyright © 2003 by Donald Mitchell. Reproduced with permission.